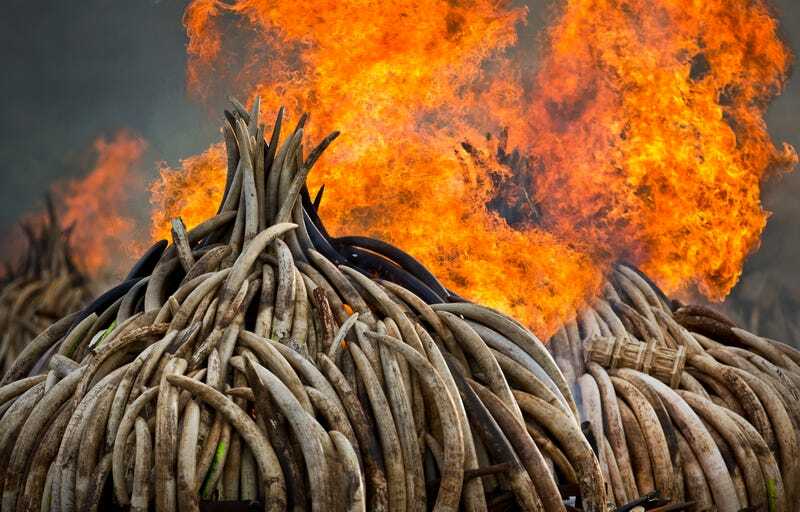 Earlier today, Kenya set ablaze 105 tons of stockpiled ivory in a measure designed to discourage the poaching of elephants and rhinoceros in the country. The blaze is the biggest of its kind in history. The ivory and horns from this burn are believed to come from 6,500 elephants and 450 rhinos, poached for their respective parts. Demand for ivory and horns has principally come from China and Vietnam, which has decimated wild herds of the animals. The ivory burning today is estimated to cost somewhere around $100 million, raising questions from some conservationists about whether such an action will help hinder illegal poaching, or if it will merely increase the demand for elephant tusks and rhino horns. Kenya and other central African countries have struggled with the demand for ivory around the world, and while prices have risen, some countries have held onto confiscated stockpiles to sell, a tactic that conservationists have decried. Earlier today, Kenyan President Uhuru Kenyatta lit the first pyre on fire, noting that his country would not be taking part in such financial speculation, and that they’re sending a clear message that poaching won’t be tolerated. While today’s burns are setting records, conservationist groups have noted that there’s quite a bit more work to do in order to preserve wild populations of elephants and rhinoceros. This 100-tonne destruction of elephant ivory shows Kenya’s commitment to the Elephant Protection Initiative (EPI) which commits a nation to closing domestic ivory markets, agreeing to put all stockpiles of ivory beyond economic use, and to addressing the elephant crisis through full and timely implementation of the African Elephant Action Plan (AEAP) that was agreed by all range States in 2010. Conservation groups believe that the wild elephants and rhinoceros populations will continue to decline in the coming decade if other measures aren’t taken.